"Are you tired? Worn out? Burned out on religion? Come to Me. Get away with Me and you'll recover your life. I'll show you how to take a real rest. Walk (journey) with Me and work with Me—watch how I do it. Learn the unforced rhythms of grace. I won't lay anything heavy or ill-fitting on you. Keep company (personal fellowship) with Me and you'll learn to live freely and lightly. "(Matthew 11:28-30, The Message) We hear the term ‘burnout’ more frequently these days, let’s make sure we understand what that term truly means. Webster-Merriam’s Online dictionary defines ‘burnout’ to be “exhaustion of physical or emotional strength usually as a result of prolonged stress or frustration.” What is interesting is that as Christians, we each have renewable strength which is daily made available through our own walk (journey) with our Heavenly Father. Psalms 29:11 declares, “The Lord gives strength to His people …” In Isaiah 40:29, the prophet Isaiah recorded this same promise,, “The Lord gives strength to those who are weary.” Then comes the writings of Paul in Philippians 4:13 which infuse heavenly confidence into our soul with these words, “Christ gives me the strength to face anything!” (CEV) Life is indeed HARD … this is not a breaking headline that needs to be scrolling across the latest news bar on FoxNews! I think what makes life uniquely challenging even more for today’s generation is that we are simply overrun with far too many choices … so many that if we leave a moment here or there unguarded (i.e. a moment of vulnerability), they (i.e. our poor, unwise choices) can sneak in and rob of us of our focus, our strength and our will (tenacity to press forward) – the term for this soul-threatening condition is called “weariness.” In his book, Leading On Empty (2009, pp. 94), Pastor Wayne Cordeiro writes, “It’s no accident that the Evil One came calling in our Savior’s moment of human vulnerability (“physically hungry” after 40-day fast in desert; Luke 4:2-3). That’s his usual plan of attack. That’s Temptation 101. The adversary lurks in the shadows of vulnerable moments in our lives. Like an uncomplaining sniper squatting in a darkened second-story room, he squints patiently into his high-powered scope, waiting for an opportune time to squeeze off a (“potentially deadly,” John 10:10) shot at his unsuspecting target.” Every Christian is a Soldier of Light for the Lord; thus, every soldier in the Lord’s army is a prospective target by our archenemy, Satan! That is why 1 Peter 5:8 adamantly warns every believer, “Be on your guard and stay awake. Your enemy, the devil, is like a roaring lion, sneaking around to find someone to attack.” We need to heed the wisdom of Proverbs 4:23 which admonishes, “Guard your heart above all else, for it determines the course of your life.” (NLT) This is why Paul directs us to put on the “full armor of God” in Ephesians 6:10-17 so that our hearts and our minds are not left unguarded which would expose us to a potentially deadly strike / attack by our enemy. Battling the Burnout Beast is truly a real battle that is on-going all around us – a battle that has mounting casualties every day! One of the most important steps to ensuring victory in this battle is our maintaining a laser-like focus upon our Spiritual Commander-in-Chief, our life mission and the very ones we are called to defend – our families, our communities and our nation! Pastor Cordeiro shares, “Knowing the remedy (i.e. 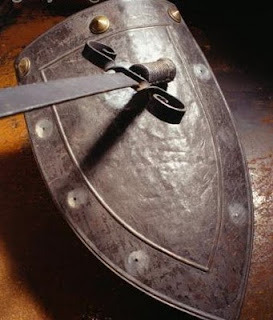 Lord’s battle plan) doesn’t necessarily complete the healing; the difference comes when we apply it! Reading the menu doesn’t fill you up; eating the food does!” (Leading on Empty, pp. 87) The problem with so many choices today is that it preoccupies our focus in an attempt to keep us from applying the Lord’s commands / directives to our lives – moving our focus instead off of the strategic areas of our faith (our readiness) and placing it upon areas of much lesser importance in life. But as the Apostle Paul reminds us in 1 Corinthians 15:58, every soldier of the Lord can “thank God for letting our Lord Jesus Christ give us the victory” (CEV) in this tenacious battle with the Burnout Beast! That does not remove the reality of the great number who are engaged in this battle today – but it does assure us that we can proclaim our promised victory to the enemy’s face because, “(This) battle is the Lord’s!” (1 Samuel 17:47). Today's Spirit-led video by CCM artist Jeremy Camp and it can be viewed by clicking on the on the song title, "Healing Hand of God."